Today we have the US consumer price index (CPI) which is expected by market analysts to fall to 2.4% year-on-year in September, comparing to the 2.7% registered in the previous period. The CPI is a key indicator to measure inflation and changes in purchasing trends. Consumer price index (CPI) in Canada fell to 2.8% year-on-year in August compared to 3.0% registered in the previous month, and consistent with analysts’ forecast of 2.8%. August CPI data was driven by a slowdown in the cost of gasoline, utilities, and shelter. Since the beginning of October, the USDCAD gained over 1.5% and is in a potential phase change, shifting from a distribution to a bullish phase. 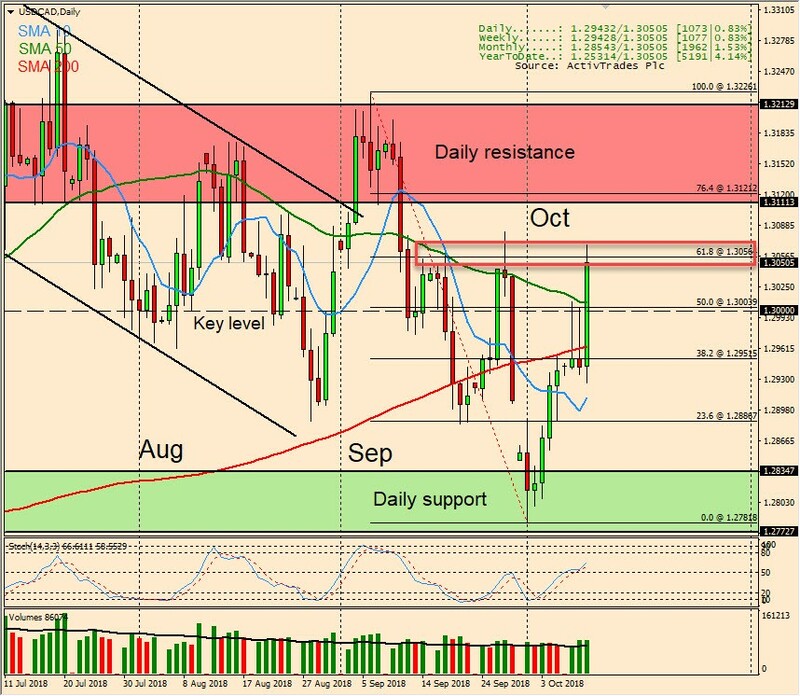 On yesterday session, the USDCAD rallied with a wide range and closed near the high of the day, in addition, managed to close above Tuesday’s high, which suggests a strong bullish momentum. The currency pair made the year-to-date high on late June at 1.3386 and since then has been in a downward trend that came to a halt in early October. In fact, it managed to bounce off a daily support and began an upward correction that is now testing the 61.8 Fibonacci retracement which may prove to be a tough resistance to crack.